Disney FROZEN “Olaf” Snowman Donuts! If you have not seen the movie FROZEN yet… you need to go soon! It’s my new Disney favorite!!! 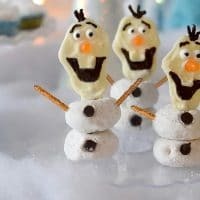 Olaf is one of my favorite characters in the movie and so we made some “Olaf” Snowman Donuts for our Disney FROZEN Party! The hardest part is making the heads which I suggest making a day or two ahead of time. They can be stored in an airtight container until your ready to use them. I hope you enjoy this fun treat as much as we did!!! 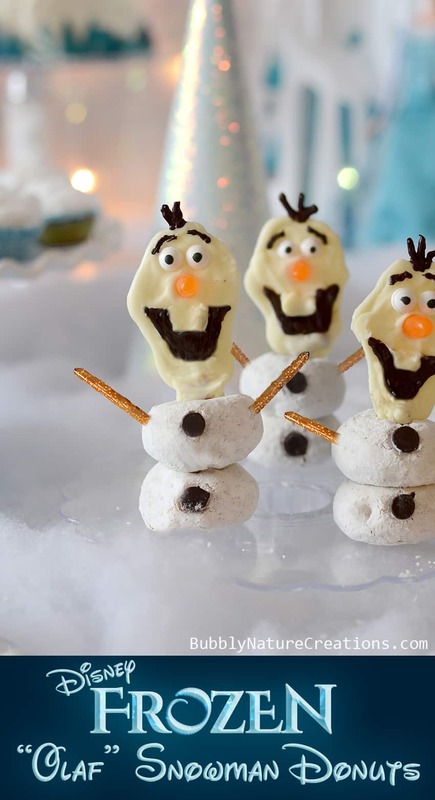 Be sure to check out the whole Disney FROZEN Party for more ideas! Disney FROZEN "Olaf" Snowman Donuts! melt both white and chocolate melts separately according to the package. Put each one into it's own candy piping bag. Make a small opening in the bottom of the bag. 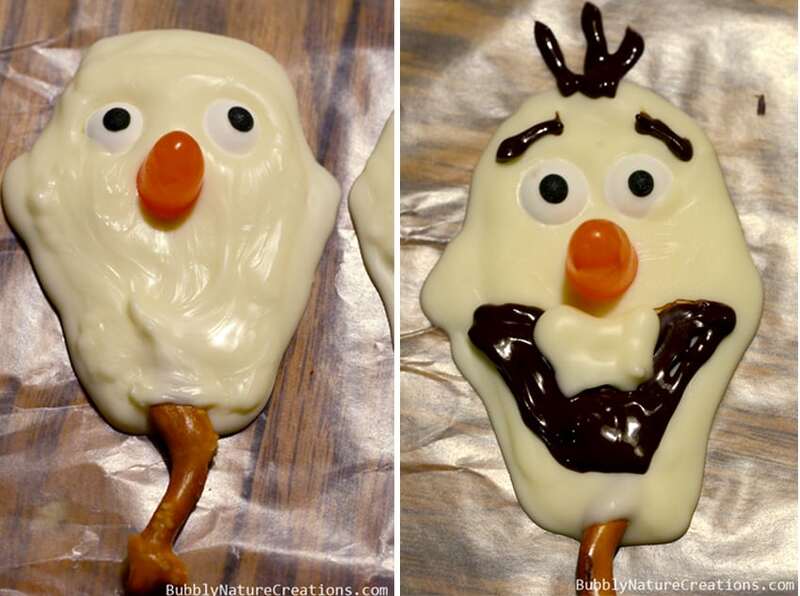 Pipe out an Olaf head shape first onto one mini pretzel stick with the white chocolate on a piece of wax paper. immediately place eyes and orange Mike n Ike for the nose while the white chocolate is still soft. Next make eyebrows, hair and a mouth with the chocolate. Add teeth with the white chocolate last. Let these harden completely before the next step. Place 2 powdered donuts on top of each other and stick the "head" pretzel stick into the donut holes. Add chocolate chips for buttons and pretzel sticks for arms. Enjoy! 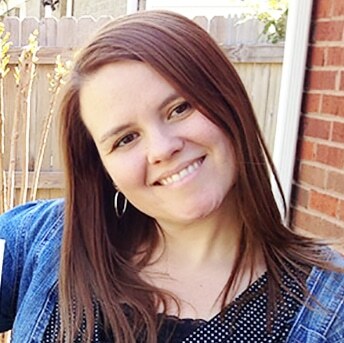 Love it, Rachel!! Frozen was such an awesome movie…I don’t say this often, but I liked it so much that I wanted to see it again in theaters. Pinned! I can’t wait to see it again either! Thanks! These are SO cute and creative! I made them for my daughter’s Frozen party and they were a big hit. We used mini powdered donuts as the base with a powdered donut hole in the middle and it was very stable and adorable. The orange Mike ‘n Ike makes the perfect nose! Thanks for sharing your great ideas. Can you please tell me what the you use for the eyes? Wilton makes them. I got mine at Hobby Lobby, but I’ve also seen them at Wal Mart. They are sold with the cake decorating supplies and come in a bottle like the cookie/cake sprinkles. Love these! I am making them right now for my daughters third birthday party this weekend. My only advice would be to leave out the teeth, mine looked great until that step but now they look a little strange. Still cute pretty thou! place and other person wil alsxo do smilar in sipport of you. On νa dire que ce n’est pas fauҳ !!! Any recommendations for work in g with the melts. Mine came out lumpy. Can we use something besides a piping bag? I am not sure about any other way to do it. You could try a different brand of melts perhaps. I used Gheradelli, but Wilton makes an excellent candy melt that is white that will probably do better… I just don’t know because I haven’t tried anything else for these. Hope that helps!